We're doing a mini version of the Maker Faire at Park Day School on Oct 24th, and thought people might be interested. I'll be there in a little booth doing henna...I love doing henna, it's such a blast! Here are some of my previous ones: http://chrishecker.com/Henna_Tattoos :) Here's a blurb about the Faire, and hope to see you there, and please spread the word to the other neighborhood lists around here: Featuring both established and emerging local “makers,” the East Bay Mini Maker Faire is a family-friendly celebration. It will feature rockets and robots, DIY science and technology, urban farming and sustainability, alternative energy, bicycles, unique hand-made crafts, music and local food, and educational workshops and installations. More information about the event is here: http://ebmakerfaire.wordpress.com Tickets are on sale now here: http://ebmakerfaire.eventbrite.com We are also accepting Makers, Crafters, Performers, Workshop leaders, etc for 2 more days only through the site here: http://ebmakerfaire.wordpress.com/call-for-makers The event is put on by a few dedicated parents at Park Day School who wanted to bring Maker culture to North Oakland and support the community as well as the school. 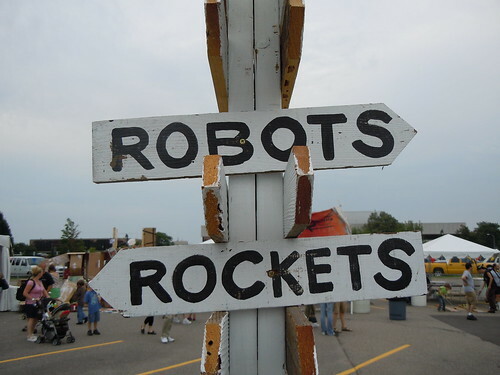 You can also follow us at @ebmakerfaire on Twitter. There is a decent blog post about the origin of this mini event on their blog. Ace Monster Toys, the East Bay hackerspace, has a proposal in discussion for the event and I know that many of us plan to attend since it is in our back yard. I encourage others to go as well.